1979 was a busy year for Motorhead. Lemmy and crew released two albums, headlined two UK tours, appeared on Top of the Pops, and played at the Reading Festival. The year started with the release of the “Overkill” album, and a March tour of the UK, with support from Girlschool. 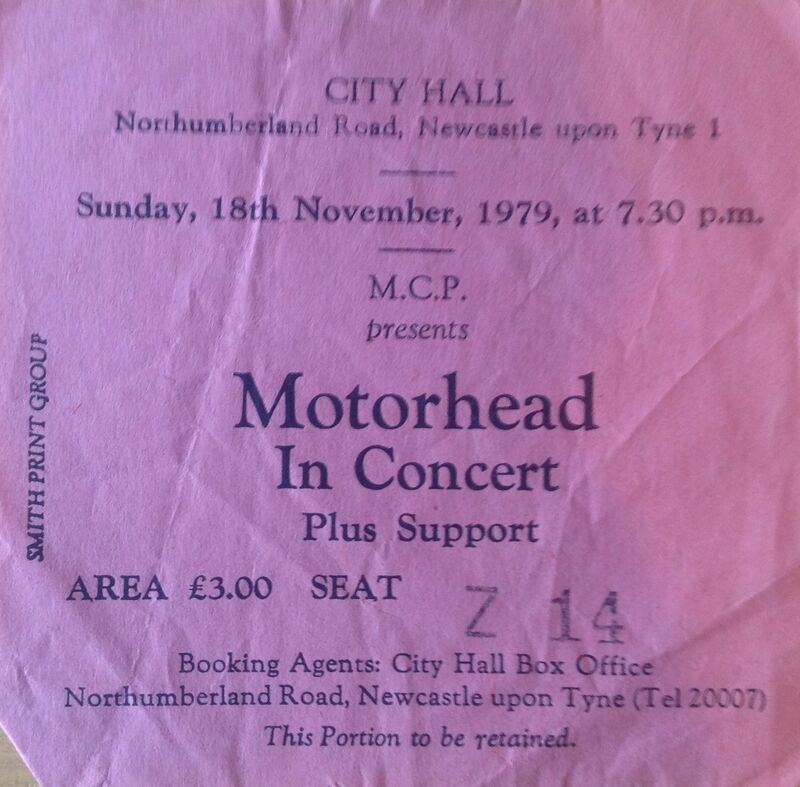 I saw the Newcastle City Hall gig, which was a great double bill and both bands put in a rocking performance. Come August, and Motorhead were third on the Friday night bill at Reading, sandwiched between performances by Wilko Johnson and The Tourists. The Friday night was headlined by The Police. Motorhead played well and got a great reception from the crowd. Reading that year had a strange line-up, which tried to mix up-and-coming new wave acts with more established rock bands. This caused a split crowd, and lots of can fights. Motorhead were one of the few bands who both camps were “allowed” to like, and this resulted in their performance being one of the successes of the weekend. 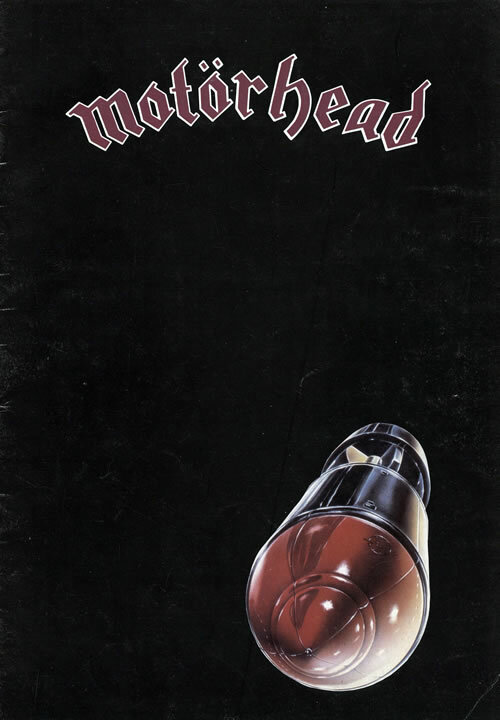 Motorhead released the “Bomber” album later in the year, and toured again to promote it. This time they had another great rock band of the day, Saxon, as support, and they called at Newcastle City Hall in November. The Bomber tour featured a massive “Bomber” plane lighting rig hanging over the band and going through its manoeuvres while they played. Great stuff. 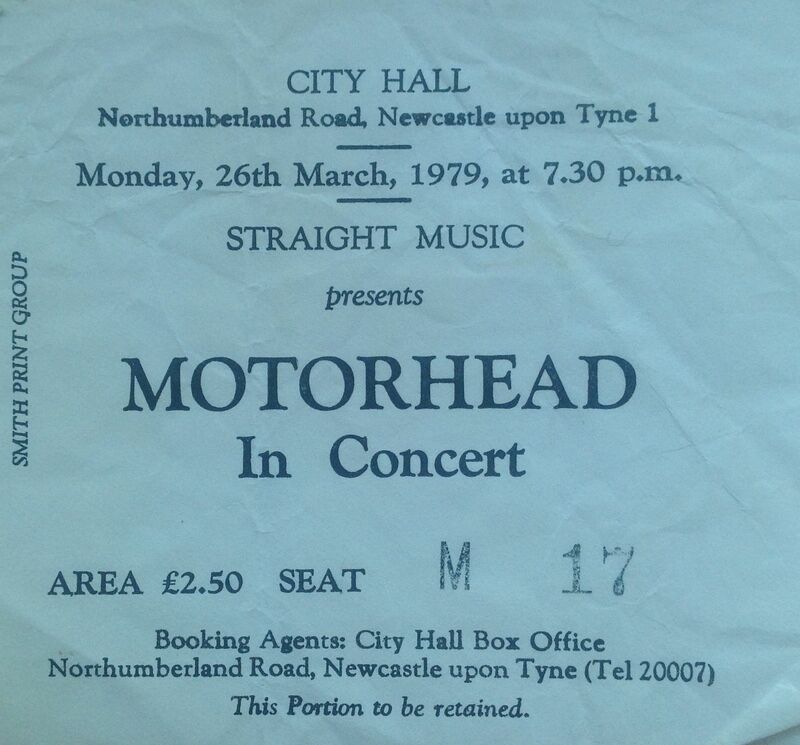 Motorhead were really at the top of their game during this period, and just couldn’t be beaten for a loud, fun night out. 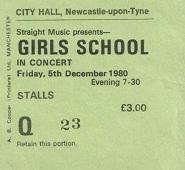 I saw Girlschool at Newcastlte City Hall again in 1981 and 1982. 1982 was a busy year for the band. The band teamed up with Motorhead on the “St. Valentine’s Day Massacre” EP. The EP contained a cover of Johnny Kidd & The Pirates’ song “Please Don’t Touch” and two tracks where the bands covered each other, with Motörhead performing Girlschool’s “Emergency”, and Girlschool playing Motörhead’s “Bomber”. The two bands performed together on Top of the Pop as “Headgirl” playing “Please Don’t Touch”. I can remember the performance to this day; it was great pun, and so powerful. If you haven’t seen it go to Youtube, I’ve just played it and it still blows away the cobwebs today. The record reached No.5 in the UK Single Chart during February 1981; the biggest hit for both bands at the time. 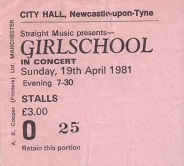 It was with this performance in my mind that I went along to see Girslschool at the City Hall in April 1981. A setlist from a BBC in Concert show of that year shows the band as playing the following songs: Demolition Boys; Tush (great cover of the ZZ Top song); Midnight Ride; Breakdown; Take it all the Way; The Hunter (not the Free song; pretty punky and a live favourite at the time); Nothing to Lose; Race with the Devil (yes the Gun song; an excellent cover); Emergency. Girlschool live were great, and very much of that time, a blend of punk, NWOBHM, and girl power attitude. The Newcastle metal hords loved them and always gave them a great reception. A girlschool gig consisted of lots of guy in denim jackets covered in the customary questions shaking their heads off and going crazy. 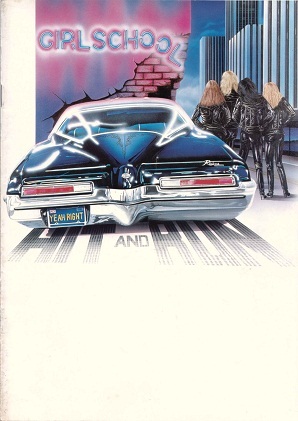 The album Hit and Run was released in 1981, along with the title track being released as a single. Both were big successes with the album reaching No.5 and the single No.33 in the charts. 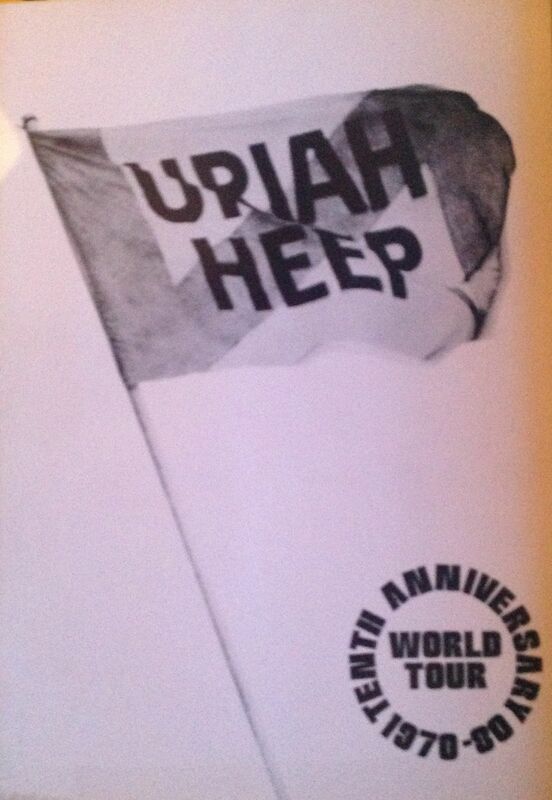 I think support for the 1981 gig was AIIZ. The band also headlined at Reading in 1981. This was the first year I missed Reading for almost 10 years of attending the festival. I went along to the Newcastle Rock on the Tyne festival. I’ve never been to the Reading festival again, which I regret. Girlschool’s third album Screaming Blue Murder was released in 1982. It didn’t do so well as its predescor, and the line-up of the band started to change at this point. 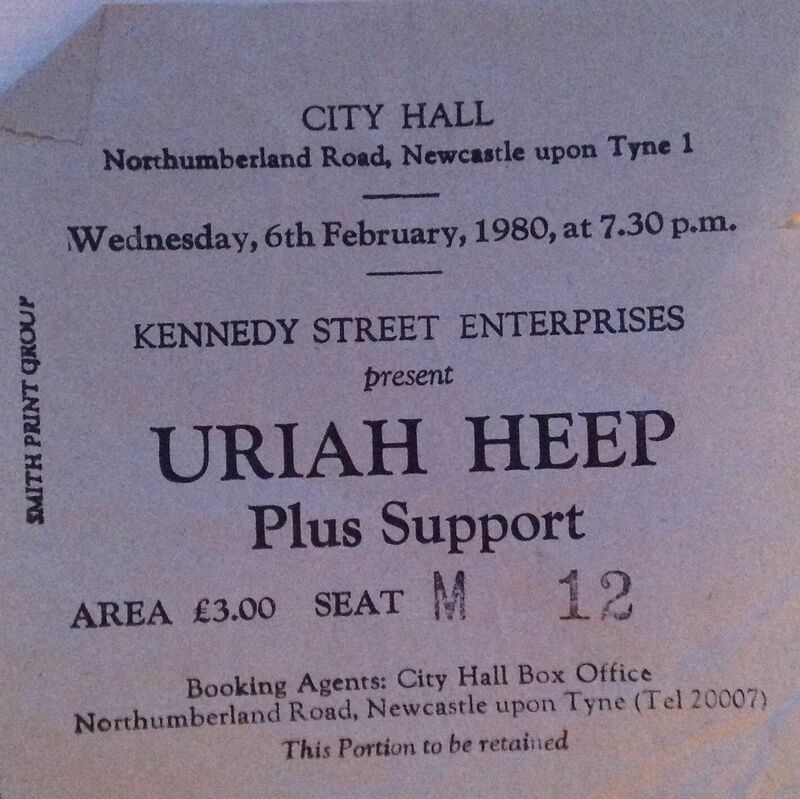 The 1982 Newcastle gig was, I think, the last time I saw the band. Time to put that right. Girlschool came together in 1978, evolving out of a band called painted lady, and drawing from punk, classic rock, and NWOBHM. 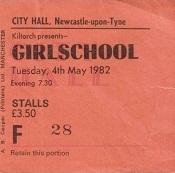 Girlschool’s original line-up was Kim McAuliffe, Enid Williams, Kelly Johnson, and Denise Dufort, and they released their first single Take it all away in late 1978. Lemmy of Motorhead took an interest in the band and in 1979 I saw them as support act on the Overkill tour. A year later they were headlining their own tour and I went to see them at Newcastle City Hall. Girlschool live were a raw hard rock band with the energy of punk and some of the speed and volume of Motorhead. I saw them quite a few times in the late 70s and early 80s; supporting Motorhead, and possibly Uriah Heep, then headlining at the Mayfair and three gigs at the City Hall. 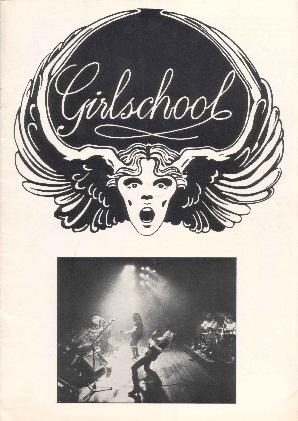 Girlschool released their debut album, Demolition, in 1980. The album also produced the singles Emergency, Nothing to Lose and a great version of the Gun song Race with the Devil. I think support act for this gig might have been Angel Witch, who were a great NWOBHM band fronted by a guy with long blonde hair who looked a little like Francis Rossi. They had a great song Angel Witch, and are still gigging today, as are Girlshool. The current Girlschool line-up features Kim, Enid and Denise from the original band. Kelly sadly died from cancer a few years ago. Another band who I should make the effort to see again!